A United States flag and flown back shell (adorned with a flag) are among the Orion exhibits now on display at Space Center Houston. Artifacts from NASA's on-going efforts to develop Orion, its new spacecraft to fly astronauts beyond low Earth orbit, have landed at Space Center Houston as a preview of a planned "portal" that will give the public a look at NASA's "Journey to Mars." Orion program officials with NASA and its prime contractor, Lockheed Martin, recently joined leaders from the Johnson Space Center to present the artifacts, which include a full-scale engineering mockup of the Orion spacecraft, a main parachute used on an atmospheric drop test and a United States flag that flew on the first orbital test flight of the new capsule. "To keep this interest alive, we are busy on plans to open a Mars and deep space exploration exhibit," he added. "The 'Journey to Mars' exhibit will be highly interactive and allow visitors to enter a Mars portal to discover technologies that will allow us to go further than we ever have before." The "Journey to Mars" exhibit will take over the floor space currently used to display a replica of a space shuttle crew cabin. On Jan. 23, Space Center Houston will open its new Independence Plaza featuring NASA's historic 747 Shuttle Carrier Aircraft and a full-size space shuttle mockup. The Orion capsule now on display was built by Lockheed Martin to test how crew members would operate inside the spacecraft. The Human Engineering Structural Mockup, or HESM, supported "risk reduction crew-interface activities." Lockheed Martin's full-scale Orion Human Engineering Structural Mockup was to used for crew-interface activities. It is now on exhibit at Space Center Houston. The parachute on exhibit is an example of the three main canopies that will lower Orion to a safe ocean splashdown after the end of its mission. Made of Kevlar and nylon, the white and orange parachute has a diameter of 116 feet (35 meters). It is the first Orion parachute to go on display. Joining the exhibit through early January is also an artifact from Exploration Flight Test-1 (EFT-1), Orion's first orbital spaceflight, launched on Dec. 5, 2014. "One year ago, we had a huge accomplishment for human spaceflight. We flew Orion's first orbital flight test," stated Mark Kirasich, NASA's Orion program manager. "The back shell panel [here] includes some of the thermal protection tiles that flew on that test flight." The panel, which was located on the EFT-1 Orion capsule below the forward bay cover and to the left of the capsule's windows, helped protect the upper portion of the craft from the intense heat generated during re-entry into the Earth's atmosphere. Covered in thermal tiles similar to those used on the underbelly of the space shuttle, this particular back shell panel was adorned with the American flag. After its temporary exhibit, the back shell panel will return to Lockheed Martin for further post-flight testing. Engineers have determined that future back shells will be covered in aluminized Kapton foil, giving the black tiles an additional silver metallic coating to reduce heat loss when the Orion is pointed to space and experiencing cold temperatures. The next flight of Orion, the uncrewed Exploration Mission-1 (EM-1) into a distant retrograde orbit around the moon, is targeted to launch in 2018. The first Orion flight to launch astronauts, Exploration Mission-2 (EM-2), is targeted to fly no later than 2023. 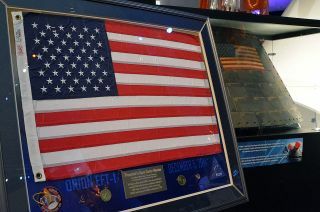 A United States flag that also flew on EFT-1 will remain at Space Center Houston after the back shell is returned. "Because of everything the team at Space Center Houston does for us in the Orion program at NASA Johnson Space Center and for the future of human spaceflight – promoting all of these things and getting young people interested in what we do, getting our message out — we have a gift for you," Kirasich said, addressing Allen. "This is a flag that flew on board Exploration Flight Test-1. It flew on the most energetic orbit that a spacecraft built for humans has done since the Apollo program ended 40 years ago." See the Orion EFT-1 back shell panel now on display at Space Center Houston through Jan. 3 at collectSPACE.com. Follow collectSPACE.com or Facebook and on Twitter at @collectSPACE. Copyright 2015 collectSPACE.com. All rights reserved.